The reliable detection of deep lying cracks in conducting samples using eddy current testing can be increased when using sensors having a high field sensitivity at low excitation frequencies[1-3]. Due to their high field sensitivity even at very low frequencies, flux gate sensors are suitable for applications where a large eddy current penetration depth is required[4-6]. We have used small probes[The fluxgate probes were provided by Bartington Instruments] with a field resolution of about 5 pT/Ö Hz and a high dynamic range of more than 140 dB/Ö Hz. With this system, we could detect deep lying cracks (more than 30 mm) in aluminium test samples and original aircraft parts using both circular excitation coils and gradiometric coils having the shape of a double-D. When using excitation field strengths of more than 200 µT, field variations caused by small and deep lying cracks in the range of a few 10 pT/Ö Hz could be detected. The bandwidth of the system covers a range of 10 Hz up to 5 kHz, which makes the system suitable for the detection of cracks hidden in aluminium samples at a depth at between 2 mm to more than 25 mm - 40 mm. Besides the determination of the spatial resolution (aperture function) and the temperature stability of the output voltage of the eddy current field response, we carried out a brief comparison with other magnetic field sensors (SQUID, GMR), focusing on their field sensitivities and spatial resolution. Flux gate sensors measure the absolute strength of a surrounding magnetic field in a frequency range usually between DC and a few 100 Hz. Flux gates differ, therefore, from induction coils, which respond to the time derivative of the magnetic field strength having a decreased field sensitivity for low frequencies. Due to their advantages in comparison with other sensors (high field sensitivity, high linearity, dynamic range and ruggedness), flux gate sensors are used in a wide range of applications such as terrestrial applications (e.g. geomagnetic observation), measurements in outer space (satellites) and naval applications (e.g. submarine detection). In most cases, the measuring principle of a flux gate sensor is based on the "second harmonic principle". The sensor itself consists of a ferromagnetic core surrounded by a modulation coil which periodically saturates the probe core. The response field is detected by a further pick up coil and contains - for a vanishing external field - no 2nd harmonic of the reference frequency. If an external magnetic field is applied to the sensor, the symmetry of the cyclic saturation process is disturbed and a 2nd harmonic amplitude of the reference signal corresponding to the external field strength appears. In our measurements we have used a small three axis flux gate probe (mag03, Bartington Instruments). It contains three single probes (each 25 x 8 x 8 mm³), each of which is connected to the read-out electronics using a 0.75 m long cable. The maximum output voltage of the sensor is limited to ± 12 V, corresponding to a maximum detectable field strength of ± 120 µT (1V / 10 µT). The field noise of the flux gate sensor is about 2.5 pT/Ö Hz for frequencies larger than 30 Hz, which results in a dynamic range of approximately 160 dB/Ö Hz. The average temperature drift was determined to be about 2 nT/°C; hence a constant temperature environment is required, when measuring very small or deep lying defects in the field range of a few 100 pT. For the determination of the spatial resolution (aperture function), we measured the magnetic field components of a single wire. In the case of a very small sensor, the distance between the maximum and minimum of the measured magnetic z-component is twice as large as the distance between a point-like sensor and the wire. However, the flux gate probe, with close proximity to the wire, is not very small, and thus it measures an averaged magnetic field due to its extended cylindrical shape. The effective spatial resolution of such an averaged field distribution is ,therefore, decreased, compared to a point like sensor having the same distance to the wire. The results of the mag03 probe with a length of about 20 mm yield an effective spatial resolution of about 14 mm, when measuring the magnetic z-component (Fig. 1 right). When measuring the y-component the spatial resolution is about 15 mm (FWHM in Fig. 1 left). Fig 1a: Field distribution of the magnetic y-component above a wire to determine the effective distance (spatial resolution) between sensor and wire. Fig 1b: Field distribution of the magnetic z-component above a wire to determine the effective distance (spatial resolution) between sensor and wire. The detection coil used in conventional eddy current systems is replaced by a flux gate sensor which is vertically aligned to the flat test object, thus measuring the vertical component (z-component) of the magnetic field above the sample under test. To realise as high a dynamic range of the eddy current test system as possible, we used an adapted excitation scheme with low excitation field at the location of the flux gate sensor.One excitation setup used a differential coil having the shape of a double D, which, in the centre of the coil, ideally has zero excitation field (see Fig. 2). When the flux gate sensor is placed above the centre of this coil, it sees only a fraction of the excitation field which the sample under test experiences. We achieved a reduction of the excitation field at the flux gate sensor of up to 1000 (-60 dB), compared to the field at the sample under test. Thus, the dynamic range is improved by three orders of magnitude. Also, a low field at the location of the sensor is obtained when a circular (absolute) field coil is used. The flux gate sensor is then horizontally aligned above the center of the coil. The system then measures the y-component of the magnetic field variation (see fig. 2). Fig 2: Differing combinations of excitation coil and flux gate probe to achieve low excitation fields at the probe. Due to the large dynamic range of the flux gate sensor, electronic compensation of the excitation field can be performed. In this case, a circular excitation coil was used, and the sensor was located with a vertical alignment in the centre of the coil measuring the magnetic z-component of both the response field of the sample under test, and of the whole excitation field. The excitation field was then electronically compensated by a phase shifted voltage of the reference signal, connected to the differential input of the lock-in amplifier. The flux gate response at the output of the lock-in amplifier is recorded by a PC, containing a standard 16 bit ADC card. However, usually, a higher digital resolution is required, when deep lying defects are measured or further signal processing is applied to the field data. The demodulated response field of the flux gate was detected by a sophisticated multimeter with a digital resolution of between 16 and 28 Bit (see Fig. 3). The sample rate of the recorded field data could be adapted to the scanning velocity (100 - 50000 samples/s). To be able simultaneously to detect both cracks at the surface and in a depth of more than 20 mm, the dynamic range of the NDE system has to be at least 120 dBÖHz for integration times of 1 s. Since a flux gate senor has a dynamic range of more than 140 dBÖHz, an even shorter integration time and thus faster scanning is possible. By means of a double-D excitation coil and a high excitation field of up to 0.2 mT (30 mm dia., 100 turns, 200 mA, 180 Hz), a 40 mm long and 0.6 mm high crack could be detected below a aluminium plate with a thickness of 12.7 mm in total. Figure 4 shows the field distribution (absolute magnetic field) above the aluminium plate, caused by the current distortion at the location of the defect. A maximum field amplitude of about 8 nT can be observed, which is approximately a factor of 4´ 10-5 (-88 dB) smaller than the excitation field strength of 200 µT. Fig 4: Left: Field distribution above an aluminium sample containing a 40 mm long and 0.6 mm high crack at a depth of 13 mm (180 Hz). Right: Sketch of the test sample and the probe. Further measurements of deep lying defects were carried out on different aluminium test samples. Fig. 5 left shows a sketch of an imitation of an aircraft wheel and its field distribution above the planar surface of the sample. The middle part of the test sample contains a larger thickness, imitating the keys of an aircraft wheel, which are used as mountings for brakes and heat shielding. At this position, an artificial crack (saw cut) has been introduced at the bottom of the test sample, leading to a distance between the crack and the surface of more than 16 mm. 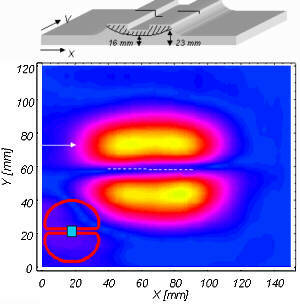 To be able to reduce the edge effects of the key structure, we used a gradiometric excitation coil (Fig. 5 left-bottom). To achieve a maximum defect signal amplitude, an excitation frequency of about 114 Hz was used. The excitation coil contains 100 turns, which results in an excitation field strength of 200 µT. The total field variation across the defect structure is about 6 nT (Fig. 5 right top). Inspecting the signal of the defect on a more sensitive scale yields (Fig. 5 right bottom) two local maxima and a short range field fluctuation of a few pT. Due to the high dynamic range, the two local maxima of the defect signal, having a field variation of about 80 pT, could be detected with sufficient signal to noise ratio. Compared to the excitation field strength of 200 µT, this measured field variation of 80 pT is attenuated by a factor of 4´ 10-7 (-128 dB). Fig 5:Eddy current measurement of an aluminium aircraft wheel imitation, containing an artificial defect covered by more than 16mm aluminium. Left/top: Sketch of the sample. Left/bottom: Field distribution above the sample. Right/top: Line scan of the defect structure at y=73 mm (postion of the white arrow). Right/bottom: magnification of the upper line scan in the interval between 50 mm and 80 mm. For a classification of different sensor types with respect to their suitability in electromagnetic NDE, several properties, such as field sensitivity, dynamic range, spatial resolution, temperature stability, handling and cost, have to be taken into consideration. Besides the flux gate sensor, only the SQUID can provide field sensitivities in the range of a few pT without inadmissable enlargement of the spatial resolution. AMR or GMR sensors are able to provide a better spatial resolution, but their field sensitivity and temperature stability is still too low. Although the SQUID sensor combines most of the desirable properties, for many applications the price for the sensor (including read-out) and its cooling environment is still very high. The authors are grateful to G. Bartington for suppling the flux gate probe. We thank W.B.Klemmt of DASA and H.-J. Krause of Research Center Jülich for the test samples and stimulating discussions. This work is supported by the German BMBF. H.-J.Krause et al., Review of Progress in QNDE, 16, 1053-1060, (1997). M.v. Kreutzbruck, M. Mück and C. Heiden, Proceedings of 7th ECNDT 98, Vol 3, 2513 (1998). J. Pavo et al, Studies in applied Electromagnetics and Mechanics, vol 12, IOS Press, Amsterdam, S. 215-222, 1997.